ERIN O’NEILL The Marietta Times Heather Ray, of Belpre, looks over the limited number of winter coats at Marietta Kmart Tuesday. February is a good month to look for deals on things like coats, hats, gloves and boots. Between Valentine’s Day discounts and Presidents’ Day deals, February is a great month to find some steals, especially if your wallet is still recovering from Christmas overspending. According to MarketWatch, a website published by Dow Jones & Co., to track the pulse of markets for investors, February is a great month to invest in a new mattress, outerwear, skis and snow gear and canned food. Yes, February is also National Canned Food Month, as well as the month we celebrate football, American Presidents and those we love. The three-day holiday weekends such as Labor Day, Memorial Day and Presidents’ Day often have chain stores touting good deals on mattresses. But a mattress is only good if it helps you get a better sleep, regardless of any deal. No one knows that better than the folks at Mattress Max in Vienna. Marietta residents and longtime small business owners Barbara Stewart and John Whistler have been in the business of helping customers obtain a good night’s sleep for more than a decade. “My golden nugget of advice after 11 years is, spend time on the mattress, pay attention to whether or not the person helping you is really interested in your well-being and be willing to spend the money,” Stewart said. You won’t find advertisements spouting the best deals in box springs at Mattress Max but Stewart said that you are making an investment in your health by doing your homework, regardless of the time of year. With winter being a roller coaster ride of temperatures this year, there may be times already that you have felt like foregoing the winter coat. Retailers are feeling spring fever as well with coats, gloves, hats, scarves and other winter outerwear being marked down. 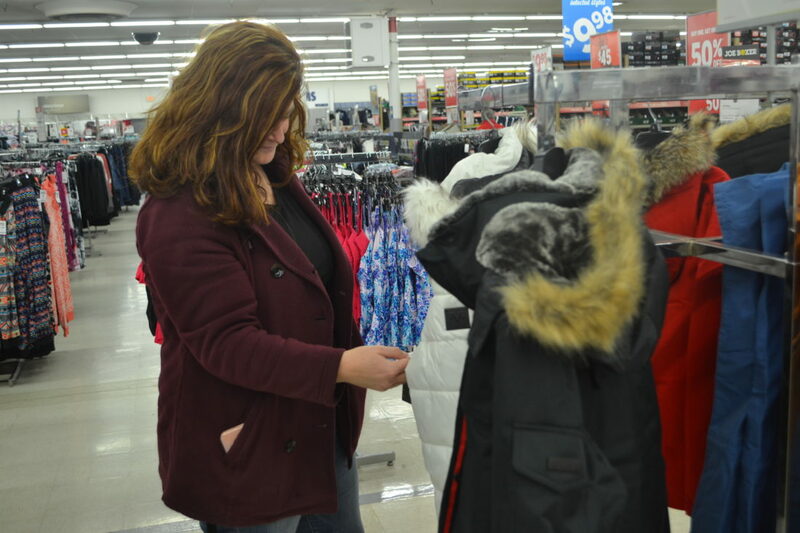 Belpre resident Heather Ray was shopping at Marietta Kmart recently and found winter coats hanging on racks between bathing suits and other warm weather wear. “I am looking for new furniture so I will probably check out some deals this month, but today we’re just looking around,” she said. Betty Beardsley, an associate at Kmart, said that the winter coats, sweaters, gloves, hats, scarves, etc., were deep discounted to make room for warm weather items. The big game is over but the best time to buy that big screen TV is now because retailers are trying to push the overstock out the door. It is possible to find good TVs selling for a few hundred dollars, while others go for several thousand, and there are many sets that fall in between those extremes. Screen size, features, and brand will all affect pricing, according to Consumer Reports. Aside from TVs, Nerd Wallet advises to avoid purchasing consumer electronics this month. Items such as laptops, desktops, tablets and video game consoles are best bought in November, during Black Friday sales. They say if you can’t wait until then, select retailers hold an early installment during “Black Friday in July” events ahead of the back-to-school season. – Chocolate (post Valentine’s Day). – Winter clothes and outerwear. Source: Market Watch, Forbes, Consumer Reports.